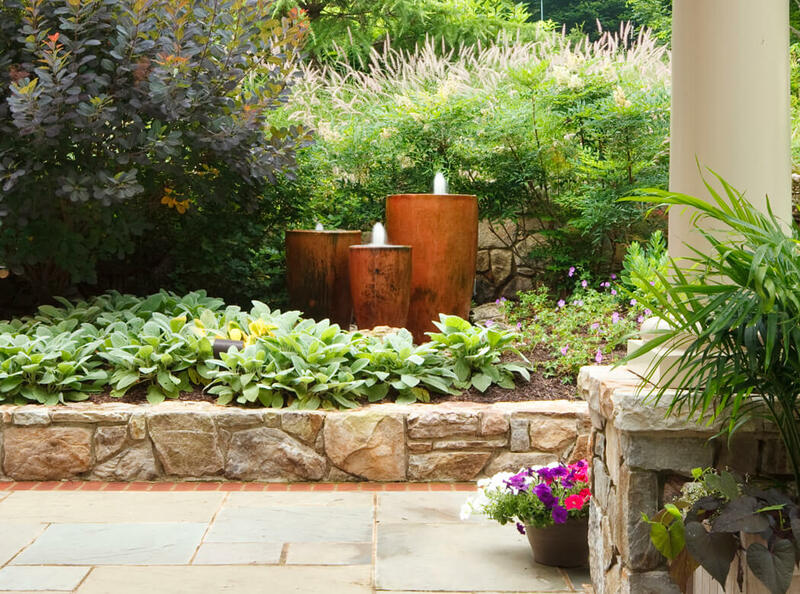 This garden water feature is designed to bring the soft sound of water bubbling up through the center of these Corten steel cylinders. Landscapes ideally should appeal to all of the senses—sight, sound, taste, touch, and smell. In fact, most of them reach all of our senses in varying degrees. 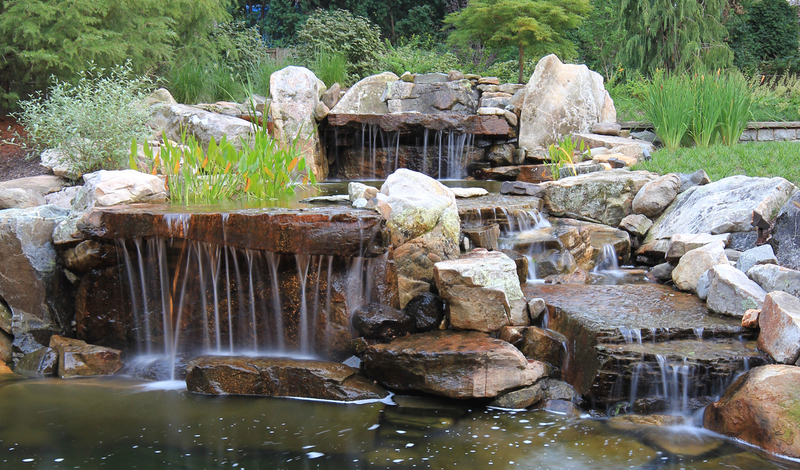 In this article, we are going to focus on sound, specifically the sound produced by garden water features such as waterfalls, ponds, and fountains that have been designed into the landscape. In a varied and well-designed garden, you are likely to experience naturally occurring sounds such as bird calls, the low hum of bees gathering nectar, or the on again off again whisper of breezes rustling through foliage. You may be serenaded by a chorus of tree frogs on a spring evening if you have wet areas near your property. Well designed landscapes appeal to all of the senses—sight, sound, taste, touch, and smell. Another type of sound, the sound of water, is one that you and your landscape architect must plan and build into your garden. Water features come in two types. Fountains and waterfalls use moving water to create splash and trickling sounds. Ponds are for stillness and a feeling of serenity. The type of water features you include in your garden will be determined by the available space and the way in which you desire them to contribute to the ambiance of your backyard environment. Also, the visual style of the backyard water features you choose must be in harmony with the garden style. That would be either naturalistic or formal garden style. When designing backyard water features, another consideration is location. For example, if we’ve decided to install a garden fountain, we need to decide whether we will locate it near a sitting area or in the distance. In a small garden, fountains can introduce a calming background murmur that fills the space around you and neutralizes street noise. In a more expansive landscape, a large fountain can serve as a splashy focal point that anchors an area of the landscape commanding attention both visually and aurally. Since they are available in a wide variety of styles and sizes, you can always find a place for a backyard fountain in your landscape design. Something that you and your landscape architect will talk about is how much sound energy you want your backyard fountain to produce. In a smaller space, you would want to be sure that the splash would not be so loud that it made you feel anxious rather than relaxed. Drop distance: the distance water drops before striking a surface. When we want to achieve a subtle effect, we shorten the “drop” or adjust the water flow to a trickle. Small fountains can introduce a calming background murmur that fills the space around you and neutralizes street noise. Your landscape architect will help you select a backyard fountain style and size that harmonizes with the architectural style of the home and your landscape design style. 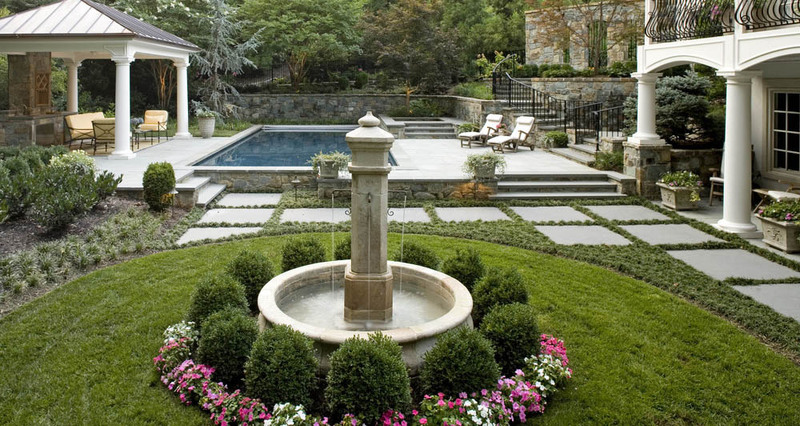 An urban courtyard with limited space would be best served by a modest fountain. Whereas, a multi-acre suburban landscape would provide a perfect setting to showcase a more elaborate fountain. Water tricking over flat rocks creates a “curtain” effect in the multi-tier waterfall. Note the varying “drop distances” of each tier that control sound levels. 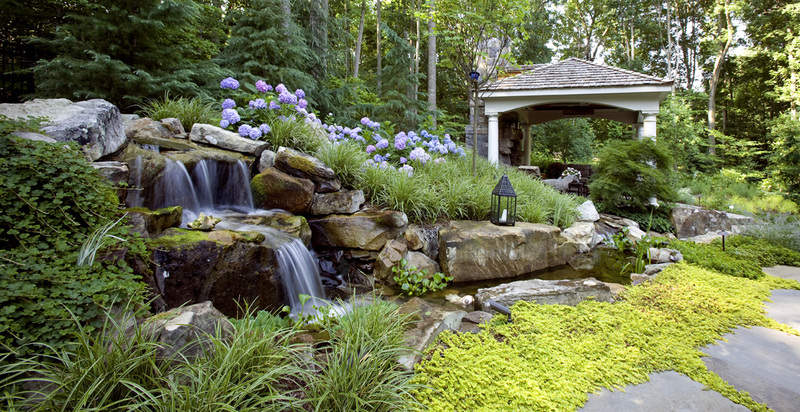 Backyard waterfalls are always done in combination with other landscape water features such as ponds or swimming pools. Depending on how the landscape architect arranges the boulders and plantings when designing the falls, a variety of visual and aural effects can be achieved. In nature, you will hear a waterfall before you actually see it. So, when designing a backyard waterfall, we design for sound as well as for the look of the feature. As with fountains, loudness is controlled by water volume and drop distance. Also, the landscape architect can fine tune the sound quality by their choice of arrival surface for the falling water. A deep pool will produce a different sound quality from a shallow pool, as will a landing surface of flat stone or boulders. In nature, you will hear a waterfall before you actually see it. Regarding aesthetic impact, waterfall design offers a much broader range for experimentation in size and complexity than a garden fountain. The landscape architect can create different visual effects by designing multiple drops or cascades or using flat stones to create a curtain effect as water pours over an edge. The palpable quiet of a garden pond or water garden inspires a sigh of relief and contentment for just about anyone who experiences it. The calm and quiet of the setting translates, almost immediately, into an internal calm and tranquility. This is why garden ponds are one of the most popular water features. 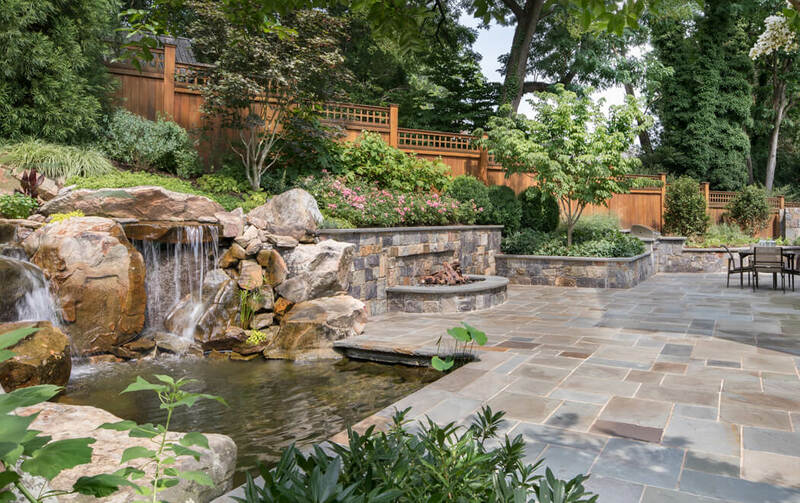 Artful use of fieldstone and varied plantings give the impression that this natural looking pond was always here. Before designing a pond for your garden, you must make a decision: fish or no fish. Both fish ponds and water gardens achieve the desired effect but come with some limitations. If you want a fish pond, you will have to invest in water purification equipment, maintenance, and fish care. Due to the requirements of keeping pond water crystal clear and fresh for the fish, you won’t be able to install stone and plants in the pond. First of all, the fish will eat any plants within their reach. And second, a naturalistic rocky pond bottom will interfere with keeping the water clean and clear by snagging debris and fish waste. This is not meant to suggest you shouldn’t go that direction if you love the idea of raising koi fish. You just need to be prepared for the responsibility–which many people find to be entirely worth the effort. The calm and quiet of a pond or water garden translates, almost immediately, into internal calm and tranquility for the garden visitor. If keeping koi fish isn’t a priority, then a water garden is the simplest way to achieve the refreshing stillness and tranquility you desire. Without the need to accommodate fish, you are free to design with stone and aquatic plants both in the pond as well as around the perimeter. Water trickling over rocks or splashing into a pool brings an additional layer of music to your outdoor environment. Landscape water features whether large or small, complex or straightforward, produce a refreshing and restorative effect. If you’d like to explore the possibilities of adding another layer of sensory pleasure to your gardens, schedule a free consultation with one of our garden managers or landscape architects.